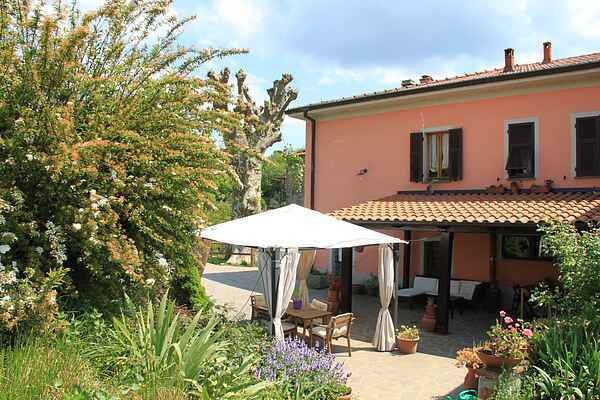 The apartment is located inside a farm, situated in a small village, whose origins date back to the 14th century, in the Canossa countryside, amongst the hills and mountains of Lunigiana, surrounded by forests of chestnuts, oaks, and olive trees. The hamlet consists of an old country house, peasants' quarters, barns, stables and 'drying houses', in which chestnuts were dried; it is here that we accommodate tourists. For relaxation, guests are allowed using common rooms and gardens surrounding the house. The farm produces vegetables, fruit, honey and has acquired a new addition of 500 olive trees which, in a couple of years, will produce organic olive oil. Besides this, we raise friendly Amiata's donkeys with which children can play. Inside the farm there's a small store of regional typical products. Lunigiana is a natural setting, rich in history and tradition. Moreover, it is situated in a strategic position, as it is close to art heritage cities, sea, and mountains. For history enthusiasts, it is possible to visit the several ancient villages and castles, the statue menhir museum (ancient prehistoric dolmens) in Pontremoli, or the ethnographic museum in Villafranca. For sea enthusiasts, you can reach Lerici, Portovenere and the Cinque Terre in less than an hour. For hiking enthusiasts, we are at the border with the Appennino Tosco-Emiliano National Park, verdant with wild landscapes and uncontaminated mountain lakes.